In 1949 the world was suddenly made aware of the zither. This minor musical instrument made evil audible in a film that seized the imagination like few other post-war productions. The Third Man hasn't lost its power to grip - or Anton Karas's tight, tense theme tune any of its nervous sense of clear and present danger. Graham Greene visited Vienna for producer Alexander Korda. As in his other travels, Greene's instinct for evil was like a divining rod and this time it guided him to the black market in contaminated penicillin which killed rather than cured - a symbol of European postwar sickness. To Vienna comes a slightly dumb American, played by Joseph Cotten, looking for a friend, Harry Lime, whom he won't believe is mixed up in the rackets. Cotten is drawn into a nightmarish intrigue that reveals the unwelcome truth and teaches him that simple friendship can conceal and even sustain a moral infection - a theme that Greene was to use in other, later writing. Although Orson Welles appears in relatively few scenes, his suave and sardonic Harry Lime, became the film's embodiment of evil - the character everyone remembers as clearly as his (not Greene's) cynical jest about Switzerland; 500 years of democracy and peace, 'and what did that produce? The cuckoo clock'. Carol Reed directs the film as a baroque homage to those masters of the Old High German cinema like Murnau and Lang. The screen is filled with shadows and one's perception of the normal is often angled (with the camera) to the sense of lurking menace. The cast mirrors the enforced internationalism of the partitioned city: Trevor Howard plays a bitter-tongued British security man. Alida Valli an enigmatic Central European beauty whose love for Harry in the movie's final, stunning shot is seen to transcend morality as well as frontiers. The Third Man, is a crime film, but it summed up shattered Europe's view of its weary past and frightening future. That zither music became the theme tune of a Cold War that still sends shivers down the spine. 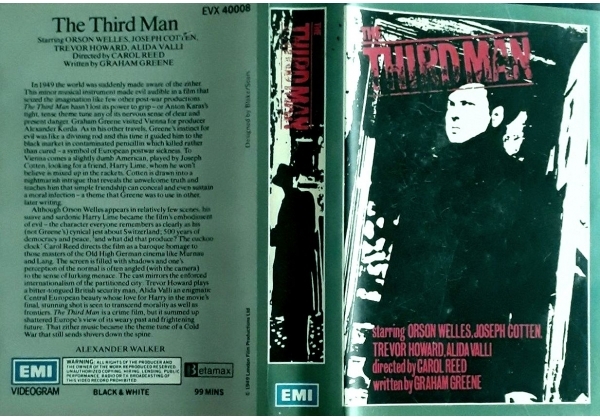 Or find "Third Man, The (1949)" on VHS and DVD / BluRay at Amazon.